Sao Paulo Cathedral is a Roman Catholic cathedral located in Sao Paulo, Brazil. 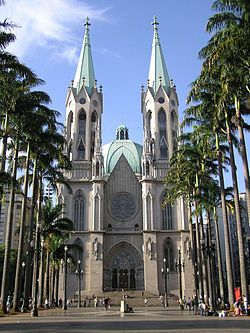 It is also known as the Sao Paulo See Metropolitan Cathedral, the seat of the Roman Catholic Archdiocese of the city. It is known for its Neo-Gothic style of construction, which took about four decades to complete. It is also considered as the fourth largest Neo-Gothic cathedral in the world. It is the largest church in the city of Sao Paulo. The history of the cathedral dates back to 1589 when the decision was made for a main church to be built in Sao Paulo, which was a small village during that time. The first church built in the site of the present cathedral was completed around 1616. When Sao Paulo became a seat of the diocese, the old church was demolished and a Baroque style church was built. It was completed in 1764. It became the Cathedral of Sao Paulo until 1911. The current church was first built under Duarte Leopoldo e Silva, the first archbishop of Sao Paulo. Construction of the church began in 1913. Work on the cathedral proceeded slowly. The inauguration of the cathedral was finally realized in 1954. But the towers remained unfinished. The towers were completed only in 1967. After several years of decay, the cathedral went through a complete renovation work in 2000 until 2002. Aside from the restoration work, the pinnacles over the nave and the towers were also completed. The original construction plans, which date back to 1912, were located and allowed the workers to make a faithful restoration of the original cathedral. The cathedral is 111 meters tall and 46 meters wide. Two flanking towers of the cathedral stand at a height of 92 meters. The church is designed as a Latin cross church with a five-aisled nave. It also has a dome over the crossing that reaches 30 meters across. Although primarily a Neo-Gothic church, the dome is inspired by the Renaissance dome of the Cathedral of Florence. About 800 tons of rare marble was used for its completion. The inner capitals of the church are decorated with sculptures of Brazilian produce such as pineapples, coffee branches and native animals such as armadillos. The cathedral can hold up to 8,000 people. The church also contains a crypt located under the main altar. It is so large that it can also be considered as a subterranean church. The crypt contains all the deceased bishops and archbishops of Sao Paulo.